The City of New Westminster had a visitor this weekend. And don’t you hate these guests that come in and trash the place? Godzilla isn’t known for his manners now is he? I was aware that a movie was being shot here. Actually, New Westminster is a prime location for movie sets. It has great deal of diversity and seeing the streets lined with location trailers is a very common sight. What we don’t often see is the actual town turned into the movie set. On Saturday my daughter and I walked down to the Quay to grab a nibble and pick up a few groceries. As we ventured down 6th Street mounds of demolished concrete were piled up along the side of the road along with pieces of twisted metal. 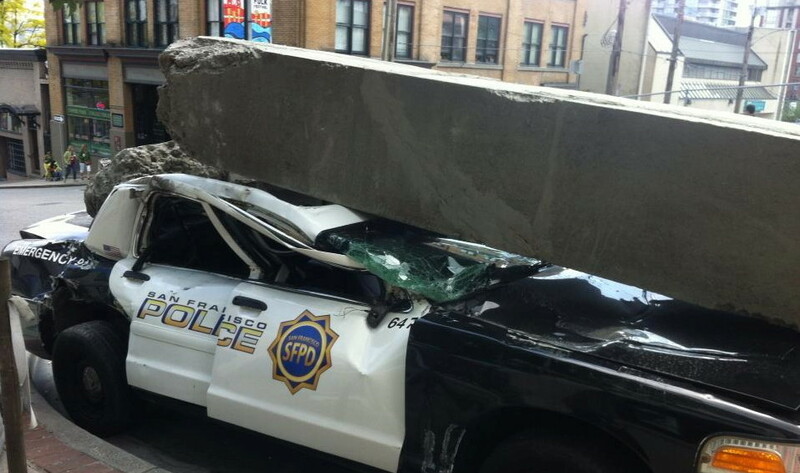 Next we came upon police cruiser (photo above) that had been crushed by one of these concrete blocks. Smiling, we knew there was a disaster in the making. Of course, lights and cables were in abundance so we were well aware this was a movie set. Last night I ventured down to check out the disaster scene. They had blocked off the road and tossed the fake concrete blocks and crushed cars all about the place. At the foot of the street a city bus sat precariously sideways in the middle of the intersection. Lights pulsed lending to the illusion of flames being reflected against the side of the bus. Galeforce wind machines sat in various locations and the smoke machine was set up and tested as the wind machine pushed the ‘smoke’ into the streets for the illusion of the dust up caused by the big guy’s foot falls I would imagine. It is interesting to see the props used to give credence to mass destruction. Godzilla has come a long way. I recall watching my first movie starring this misunderstood reptilian tyrant when I was about 7 years of age. We used to attend the Saturday matinees as kids. Twenty-five cents got you in the door. Parents were never in attendance at these functions. Just a theatre full of kids hopped up on sugar watching double matinees. Another ten cents went for popcorn. This took a huge bight out my allowance. In fact I could typically only go one a month as my allowance was twenty-five cents a week.Talk about slave labour. The work I had to do to get that measly stipend was substantial. In any case, my introduction to Godzilla was in black and white. A disjointed monster stomped down the streets of Tokyo with spurts of flame shooting from his mouth. Man, that is some kind of heart burn, isn’t it? Fighter planes dived with guns a blazing only to be smacked out the air as one would a fly. I felt sorry for the big guy and quickly championed his cause, though to this day, I really am not too sure what his cause is. Seems to me he has died a thousand deaths and continues to bounce right back. The movies sets back then were not very sophisticated. Still the ingenuity and the illusion conjured by the imagination have always been appreciated. I like science fiction. I like what can be done with it and love the challenge it often presents. It doesn’t really have to make sense. This weekend I went to see the new Star Trek movie ‘Into Darkness’ as well. Loved it! I have watched every series and every movie, though I did not care for Deep Space Nine. I really felt that one deviated away from the premise of the show a bit too much. I am digging this new round of Star Trek. I like the idea behind it and I applaud the actors. All of them have had to step into some pretty tall shoes and emulate some of the most memorable characters ever to come from television. The thing with that show is that every character mattered and each brought a unique perspective to it. My girlfriend and I joined in at the end of the movie reciting the mantra, ‘Space…the final frontier…’ Yes, we are a little geeky and admittedly so. Godzilla left New West last night. At least his entourage cleaned up after him. I googled the location to see if looked anything like our little corner of the world and no it doesn’t. That’s okay. With the magic of the movies, I am certain they’ll be convincing. But then when something has been destroyed, kind of hard to know what it may have looked like.